But I couldn’t. As I explained at the time, I was like a shark. These carnivorous creatures need to keep swimming to stay alive. The constant motion of variegated doings fueled my existence. One moment I’m in a class studying quantum physics, the next I’m getting sponsors for a live hockey broadcast, the next I’m debating Aristotelian philosophy, the next decoding recently released documents on the Soviet space program, the next I’m reading original 19th century newprint, the next I’m pitching the softball team to a championship, the next I’m DJing a top-rated AM radio show, the next I’m organizing another totally awesome party and the list goes one. I’m not kidding. All this really happened. I say this not to boast, but as a prelude to what happened one day sophomore year that changed my life forever. I belonged to the “Astronomy Book Club.” You know what I’m talking about. It’s one of those “buy 4 books for a penny and you can quit at any time” clubs. I regularly joined these clubs, stayed for awhile, then quit. Every so often, the Astronomy Book Club offered a book on a different subject matter. 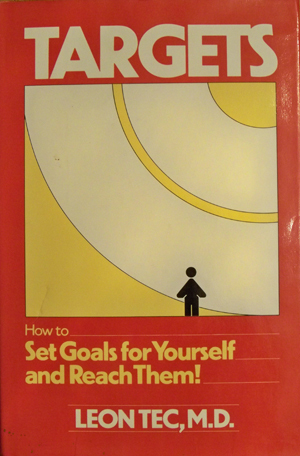 That’s how I first saw Targets: How to Set Goals for Yourself and Reach Them! It was a short book (187 pages) that promised a lot. You see, by sophomore year this shark had been collecting a large portfolio of fun, entertaining and ultimately character defining experiences. On the verge of conceding to my parents’ common sense demands, I did what any other red-blooded American teenager would do. I rebelled and found a solution – just to prove them wrong. The fact Dr. Leon Tec had a background in psychiatry piqued my interest. Among the various unrelated things I did included working for the University’s Psychology Department (who unsuccessfully tried to woo me away from the Astronomy Department). Even back then I had more than a passing interest in behavioral psychology. The allure of marrying techniques from that field with personal management attracted me. But we really fascinated me comes from Tec’s belief that he could organize your behavior in a way that “enables you to get the most out of yourself, regardless of what your objectives are and regardless of what your skills and talents may be.” He repeats this constantly throughout the book – precisely because people refuse to believe it’s true. For a math nut like me, Tec’s structured approach to “establishing goals and pursuing goals” represented pure gold – and a big kick in the pants. Using his ideas as a seed, I opened up the drop-leaf desk in my tight room and created a series of worksheets and procedures to help me keep track of all the activities I was then involved with. Not only did this help me as a sophomore, but it allowed me to expand my collection of tricks to include such frivolously amusing goings-on as running a roommate in a campus-wide election (his only stipulation: he must lose), inspiring 400+ students to wage victorious battle during the annual Bladderball contest and procuring a headless human skeleton as part of a Halloween stunt for a History of Science class held in the seminar room below our room (can anyone hum the tune to Bach’s Toccata and Fugue in D Minor?). Targets helped me accomplish goals I only dreamed of, it helped me realize I didn’t need any outrageously special talents to do them and it helped me create a process I’ve used to help other people do the same. If that’s not life changing, I don’t know what is. I called Dr. Tec to interview him for this post. His service took the call be he never returned it. I’ll try again.